In 2014 Monticello began its launch of the Mountaintop Project, a multi-year effort to restore Monticello as Jefferson knew it, and to tell the stories of the people�enslaved and free�who lived and worked at Monticello. Visit Monticello to see historic changes under way, and learn online about the restoration and preservation of Mulberry Row, the upper floors of the House, and Jefferson�s historic Kitchen Road. As part of this project certain trees near or around Monticello have been removed. Virginia woodworker Kirk McCauley is one of several local artisans The Thomas Jefferson Foundation has entrusted to honor the beauty and historic significance of these majestic trees. He pursues his passion for hand turned wood artwork in North Garden Virginia, and is a member of the Central Virginia Woodturners and American Association of Woodturners. 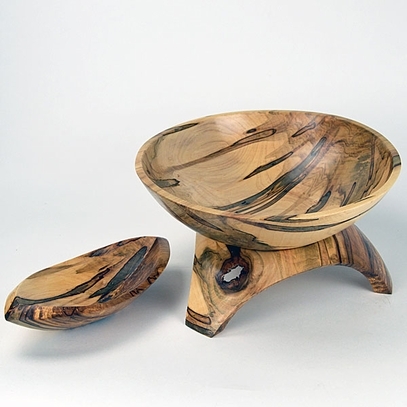 Wood from an Ambrosia Maple tree has been used to create this beautiful three piece set (bowl, stand and side dish). Signed, dated and numbered. 12 �� dia x 6 ��h (with stand).